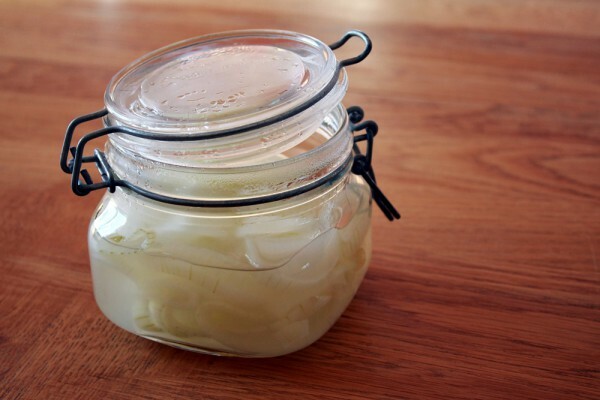 Learn how to make Pickled white onions in this simple recipe. After trying this they could be your new best friend, that jar that goes with everything and never disappoints. 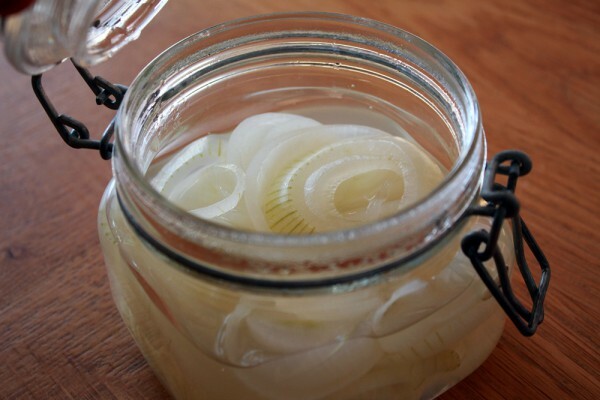 Pickled white onions go with everything and is the perfect thing to always keep in the fridge. I usually use it for tacos, burgers, salads and hot dogs. And this is just the obvious things pickled white onions pair great with. You can of course serve it with steak, fish, on a spicy bruschetta or maybe in an omelet? As usual, your imagination is the limit. This recipe uses two onions, that’s usually enough for a taco dinner for 4-6 people but if you want some to be left over just double or triple the recipe. That is often what I do if I’ve got a dinner planned I make some extra so I can use it for my coming dinners. I haven’t made a dish with these onions in this post but there are so many great things they go with. If you’re want to get some ideas I think its safe to say that they go great with any of these tacos. If you want to try something else you can swap the pickled red onions in this recipe for the white ones. Not a bad way to go. Pickle white onions is of course not the only thing you can pickle. You can use this method for almost anything. Here are a few other things I pickled in the past, feel free to try them out. They are just as tasty as these ones. The pickled white onions will last at least two weeks if you keep it cold, it probably lasts a lot longer but I never tried because in two weeks time you will have eaten it all. Peel and slice the onion. Add the sugar, vinegar, and water to a pot and bring to a boil. Rinse the onion in cold water and then add them to the pot and bring to a quick boil. Lift out the onion out of the pot and put them in the mason jar, pour over the liquid so all the onions are covered. Close the lid. The onion is ready to serve once it’s cold. You can leave it to cool for the first hour or so at room temperature, then move it to the fridge. If you really want to nerd out on onions a good start is this Wikipedia article about onions, there is much to learn.